Hello, everyone! 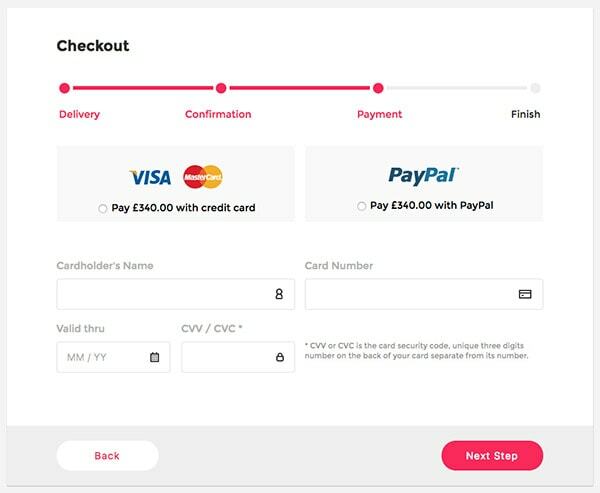 In this tutorial, we are going to create a Shopping Checkout Form using HTML, CSS3 and a little bit of jQuery. We’re going to use Google Fonts for this tutorial, specifically Montserrat. The first thing we need to do is to create our HTML structure. We need a container to wrap everything around, we’ll name it “checkout-panel.” Inside we’ll have two main sections, a body and a footer. Now that we’re done with the HTML, let’s make our checkout panel look cool. We’ll give the page some basic styling and center our panel. The next element is the .progress-bar. We will use Pseudo elements, :before and :after to style the step progress bar. Notice the power of Pseudo elements and how we used it to make the progress bar. The next element is the .payment-method. We have two payment methods, one for credit cards and one for PayPal. Divide the space in two columns, and align using flexbox. Great! Now we have a section with multiple input fields with information about cards. We can change the color of the border on :focus and add an icon for each input tag. We’re almost done. The last thing we need to style is the .panel-footer. Here we have two buttons, a .back-btn and a .next-btn; align them properly using flexbox. Give them different colors and animate them a little bit, so there’s a hover action that scales a little using transform and transition. One last thing: Notice that when you click on the payment method it only checks the radio button? For more finesse, change the border color of the box when it’s checked. Do this using jQuery. First, make sure you include jQuery and then add a class named blue-border. Awesome! The tutorial is done! Take a look at the demo and let me know what you think. I hope you enjoyed this tuorial and learned something new. If you have any questions, ping me!